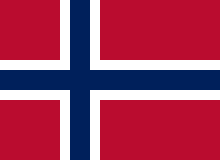 Norway competed at the 1952 Summer Olympics in Helsinki, Finland. 102 competitors, 96 men and 6 women, took part in 72 events in 14 sports. Earlier in the year, Norway had hosted the 1952 Winter Olympics in Oslo. Five fencers, all male, represented Norway in 1952. Norway had nine male rowers participate in two out of seven rowing events in 1952. Nine shooters represented Norway in 1952. Erling Kongshaug won gold in the 50 m rifle, three positions and John H. Larsen, Sr. won gold in the 100m running deer. ^ "Norway at the 1952 Helsinki Summer Games". sports-reference.com. Retrieved 15 February 2015. ^ Evans, Hilary; Gjerde, Arild; Heijmans, Jeroen; Mallon, Bill. "Norway Rowing at the 1952 Helsinki Summer Games". Olympics at Sports-Reference.com. Sports Reference LLC. Retrieved 10 March 2018. This page was last edited on 28 March 2018, at 17:57 (UTC).